A fairy exchange is no robbery. My friend Caroline( http://www.carolinemccatty.blogspot.com/) and I have been exchanging fairies at Christmas for some years now. The enamel fairy is my offering for this year. We have a theme which we choose in January, this year was faded fairy, in the past we have swapped scary fairy, furry fairy, famous fairy the list goes on. But I think this year we have both been so absorbed by the new processes we have been learning that the theme has taken a bit of a back seat. 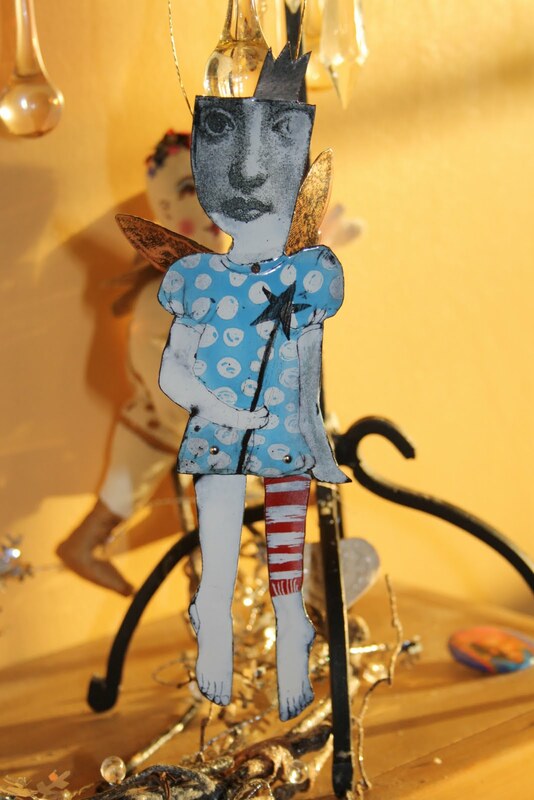 I am thrilled to be the recipient of Caroline's first posted automaton, as usual I feel like I am getting the better end of the fairy deal (not complaining). It does look like we have both upped our game some what, goodness knows what we will do for next year. Collaborations with friends is a wonderful way to make things, it is always an inspiring and fulfilling process. Thankyou Caroline! WOW those are both amazing! I love my fairy Sue. X Thank you! Fairy fairy nice. You are two clever and talented girls! I like your enamel figure brooches very much!